Express Marrakech (apologies to Crosby, Stills & Nash). We’ve had a crazy few weeks that included the very sad death of my father-in-law. 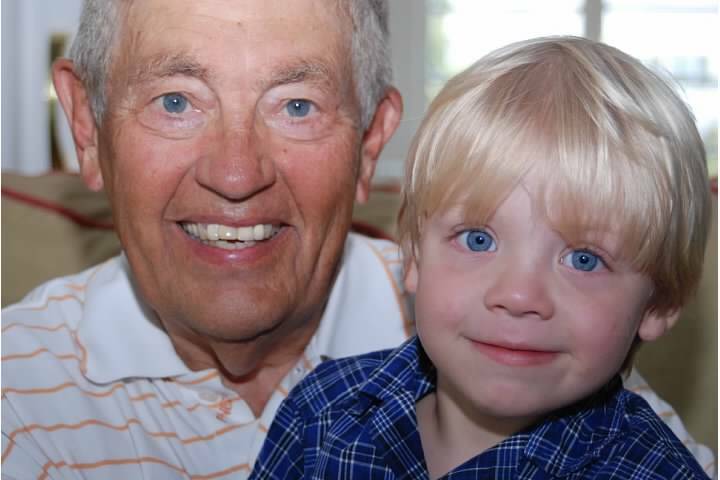 He was a kind, humble, easy-going man and a wonderful grandfather (“Grumps”). We will really miss him. After waking up at 6:15am to an urgent text, we scrambled and were on an 11:45am flight out of Geneva back to the U.S., leaving a lot of still-dirty laundry and a messy apartment in our wake. Our return was no less dramatic. We arrived bleary-eyed from the red eye, caught the 1.5 hour train back home, and the male Hatches slept while I went to the hospital to have stitches removed (from a bigger-than-anticipated surgery just prior to our unexpected week in the U.S. – my pinky finger still has a weird mini-spear protruding from it! Handy for spearing olives… but I digress). 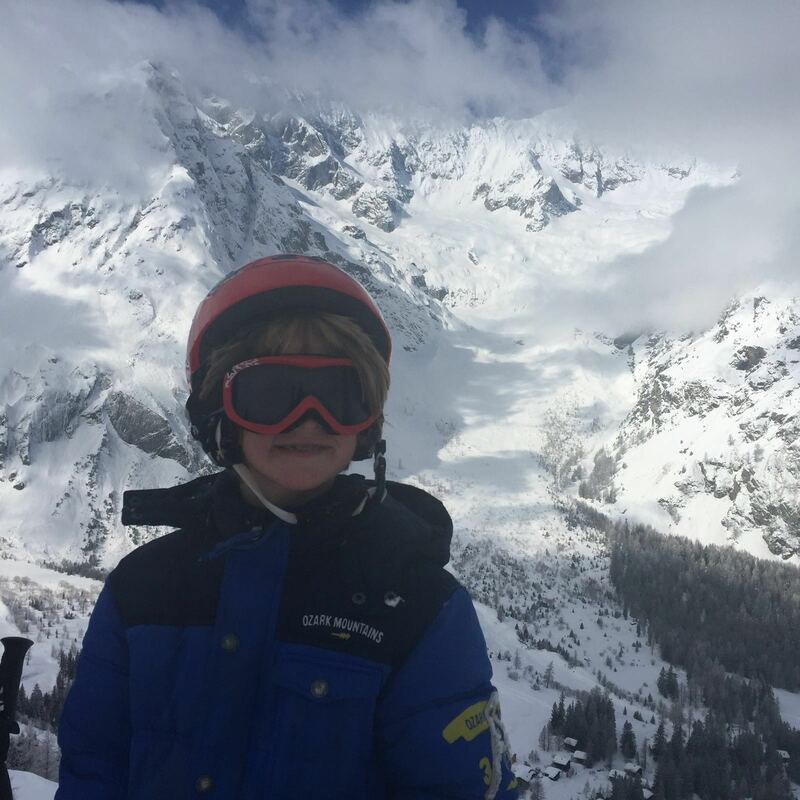 Upon my return, we packed the kids – dirty clothes and all – into the car and drove them two hours to catch up to their school’s weeklong “ski camp” in La Fouly in the Valais Canton. 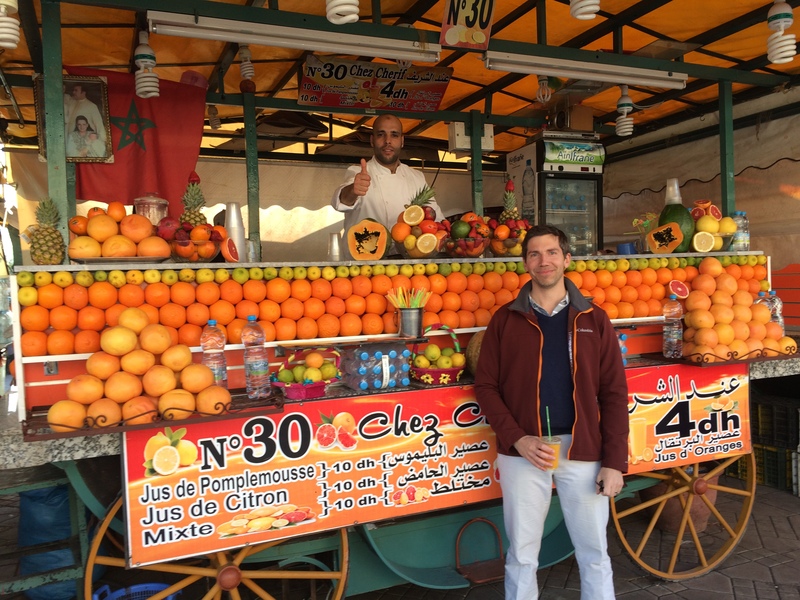 The next day, PapaHatch and I flew directly from Geneva to Marrakech, for an economical (thanks, EasyJet!) and well-timed three-night/two-day getaway. It was a welcome antidote to the sad week of grieving we’d had the week before: a relaxed enough pace to allow reflection but exotic enough to really transport us. I had been to Morocco for a cool work trip way back in 2001 and had always wanted to return with PapaHatch. More than any place I’ve been, Marrakech tantalizes one’s sense of smell – in a good way – with an intoxicating brew of spices and incense that permeates the air. We brought home the best approximation we could: a small block of amber incense and 100 grams of “ras el hanout” (a common Moroccan spice blend). Almost all buildings in Marrakech are a light pink color – our host called it “The Cinnamon City.” The old, walled part of the city is called the Medina, and within it a veritable rabbits’ warren of souks (market stall after market stall). To the east are the impressive and huge Atlas Mountains. 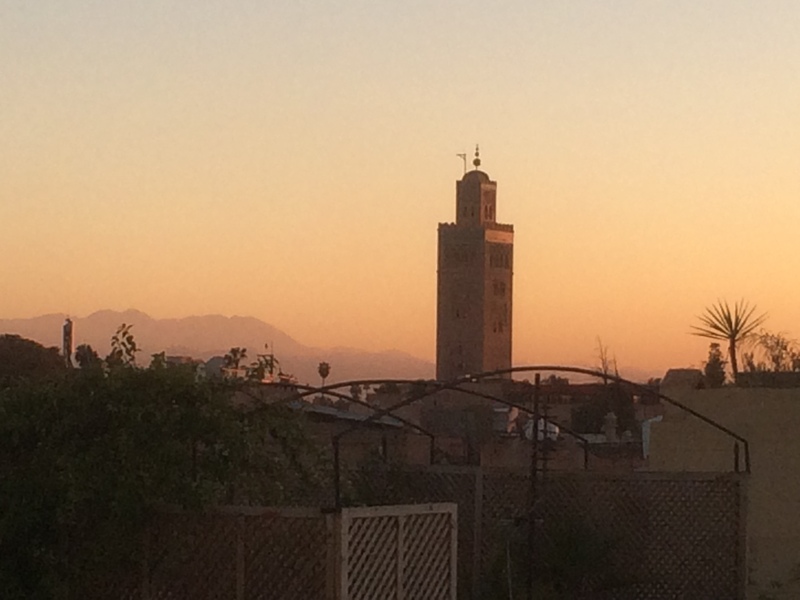 With no buildings taller than the Koutoubia Mosque, it’s easy to imagine what it was like hundreds of years ago, when Marrakech was an important juncture of a critical trade route. Because of the constant flow of people from distant lands – not to mention the occupations by the Spanish and French – it retains a rich history and intriguing vibe. There is still a significant Jewish population, though the vast majority is Muslim. 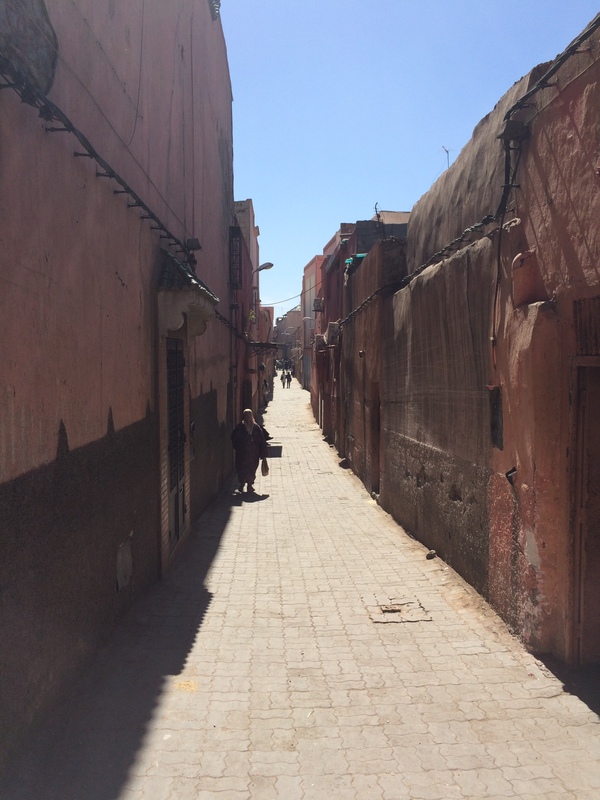 We stayed in a “riad” in the middle of the souk-filled Mouassine district. 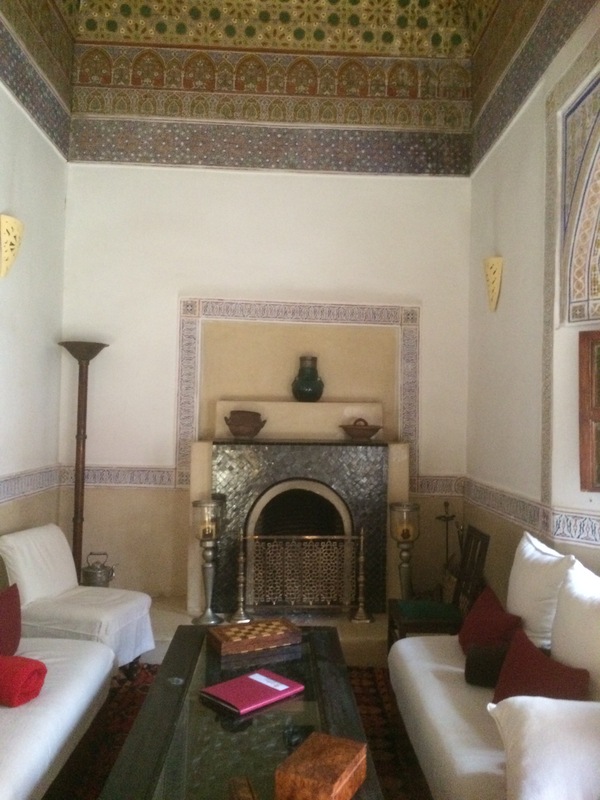 A riad is Moroccan house – often two stories rising around a peaceful courtyard. There are usually no windows to the outside, for the sake of privacy and temperature regulation. Many of Marrakech’s riads have been transformed into lovely small hotels. In fact, there are so many that choosing one can be quite overwhelming. I used reviews, price and location as my driving factors to narrow down the options, and we were very happy with our choice: Riad El Zohar Due to a cancelation, we were the only guests during our three nights, and the personal attention we got from the delightful British owner, Allan, was unrivaled. 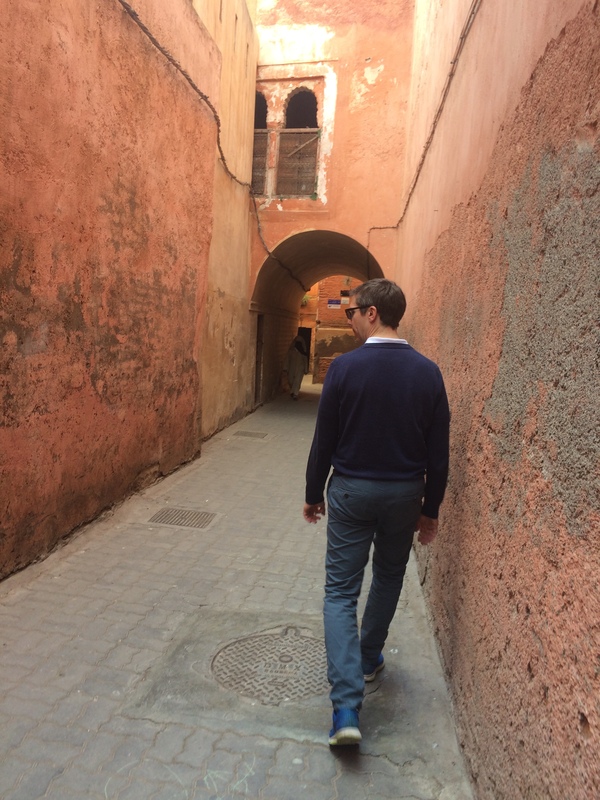 His best advice came before our arrival: download the app Hip Marrakech – this way, we’d always have a map with us (works offline! ), and indeed it really saved us. 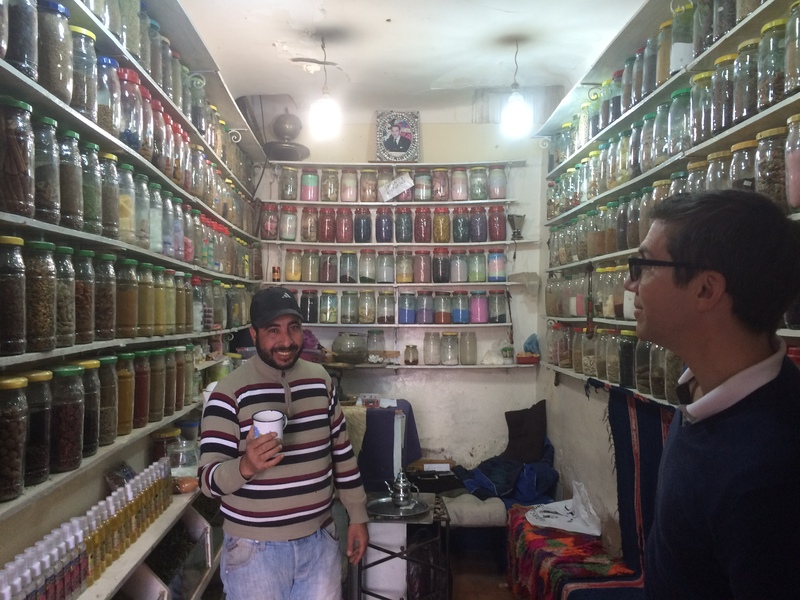 He also walked us around our first morning to orient us in the labyrinth of souks in the neighborhood, and his advice was invaluable regarding do’s (if you’re lost, ask a market stall proprietor) and don’ts (do not let anyone “guide” you to the square or a museum). 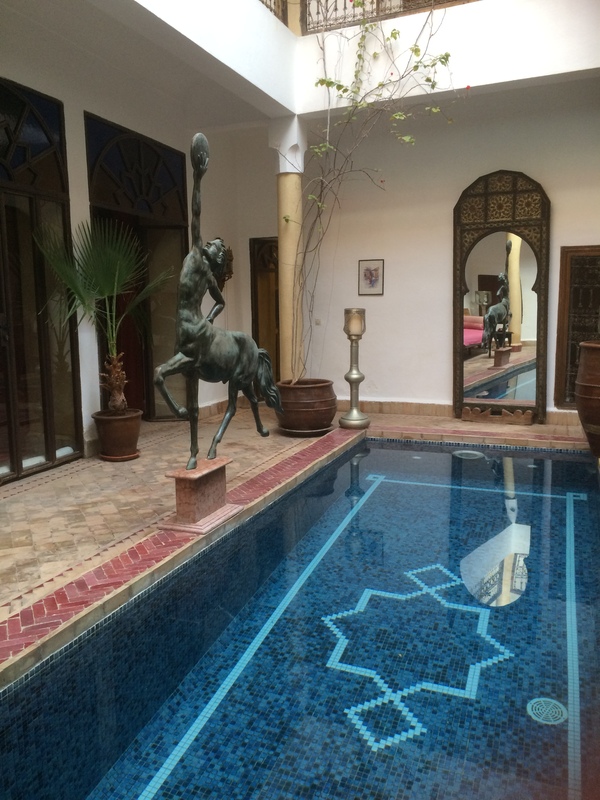 The riad itself was a peaceful oasis in a sensory-overload kind of city. 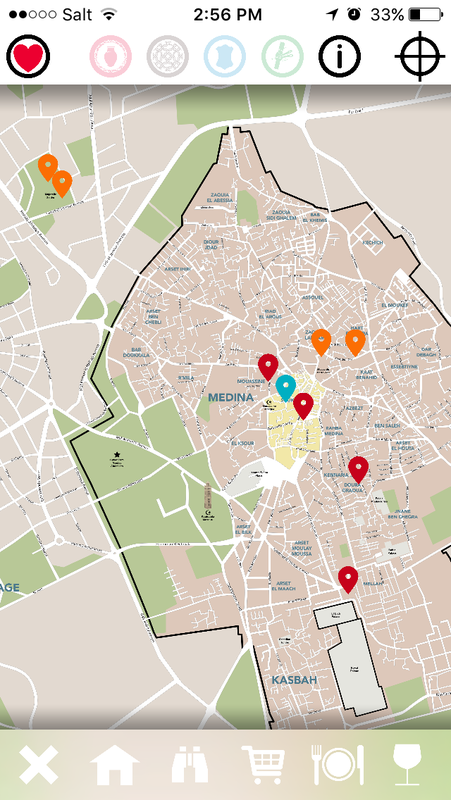 Our destinations as mapped out on the app Hip Marrakech (blue is our riad, orange=sights, red=restaurants/bars). 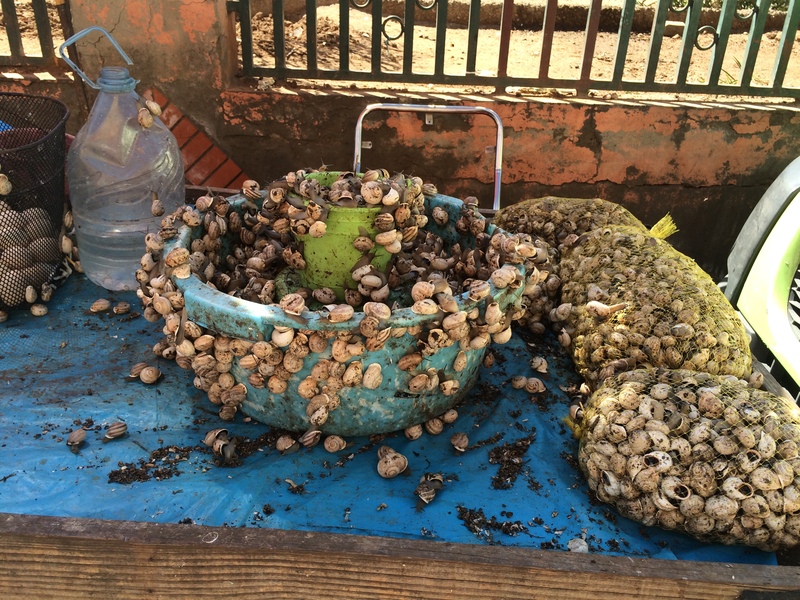 Marrakech is a cacophony of sights, sounds and the aforementioned smells. To us non-Muslim Americans, it felt so different from every other place we’ve been this year. 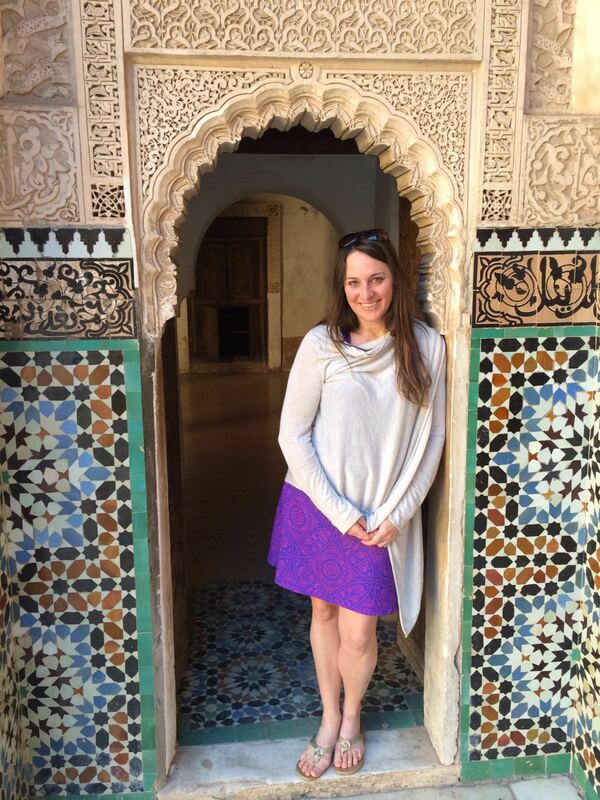 The first day, having been assured by both guidebooks and our riad host that while relative modesty is appreciated I could really wear whatever I wanted, I felt confident in wearing a knee-length dress with a long-sleeved sweater I wrapped around to cover my décolletage. I still felt self-conscious, and PapaHatch detected a high degree of staring at my lower legs. After that, I wore pants and definitely felt more at ease. Far fewer Moroccans than I expected – especially women – were dressed in non-traditional (“western”) clothing. Many of the men wore djellaba, a hooded robe, and the women wore loose-fitting garments that covered arms, legs and hair. A few women also added a veil that covered all but their eyes, though we never saw anyone wearing a burka. 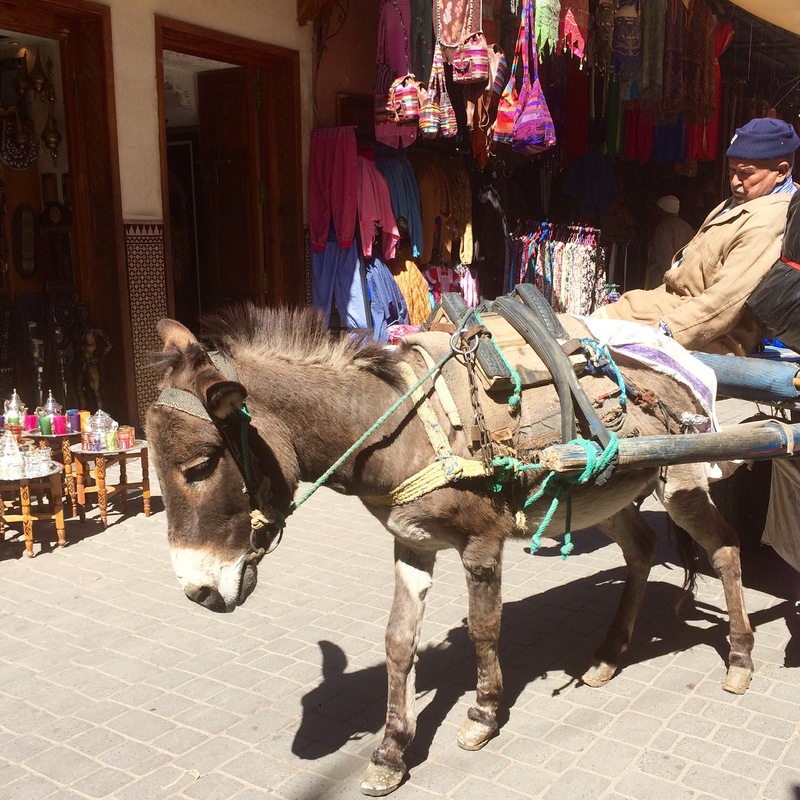 There really isn’t THAT much to do in Marrakech other than soak in the fascinating culture. We went to the Majorelle Gardens (with its seemingly weird connection with Yves Saint Laurent) and the Maison de la Photographie, both pleasant. We checked out Ben Youssef Medersa, the old Koranic school – which has some lovely features but has seen better days. I also dashed into a cool “little house” (Musée de Mouassine) hidden away at the end of an unlikely path that is being lovingly restored to its former glory. Non-Muslims aren’t allowed in mosques, but we did love the periodic call to prayer, which begins with one Imam at the top of a minaret and quickly spreads to all the mosques throughout the city. 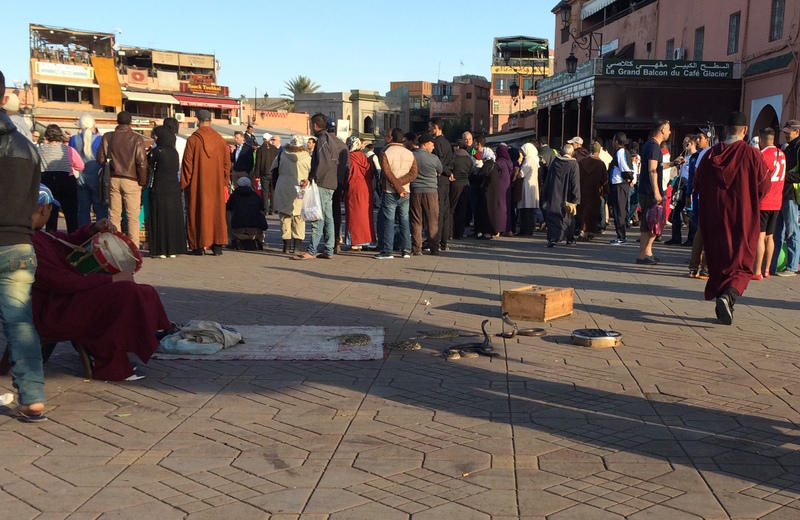 The souks and the big, crazy main square, Djemaa el Fna, are the real main attractions. 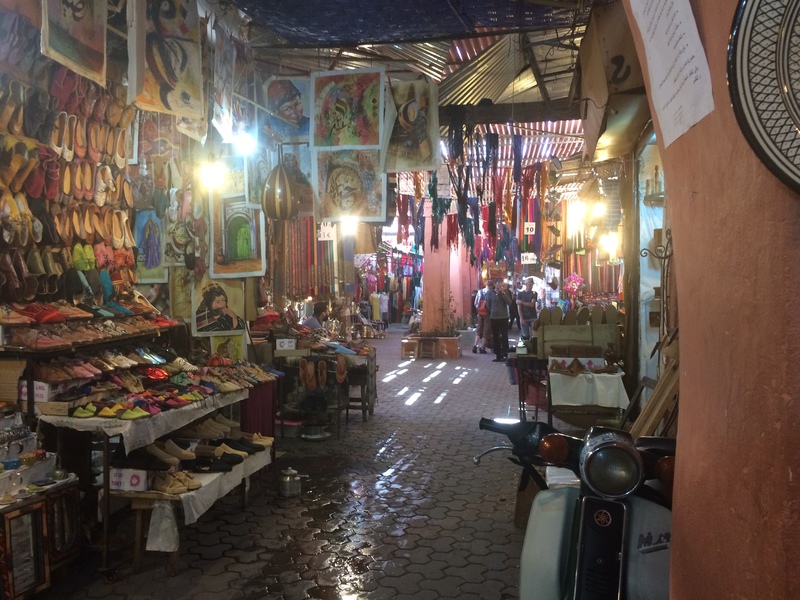 The souks can be a intimidating, as they are a warren of twists, turns and dead ends and it’s not hard to feel claustrophobic among the constant harassment to take advantage of a “special price.” Bargaining is part of the game… a game that I truly do not enjoy. I wish I did, but I just don’t. I am not a big shopper generally, although this is one place that I could indeed spend plenty of time and money – cool jewelry, gorgeous lamps, intricate wooden puzzle boxes. In the end, we barely bought anything, mainly due to my incredible self-control… but also because anything we acquire must be transported back with us to the U.S. at the end (see Everyone has Baggage). 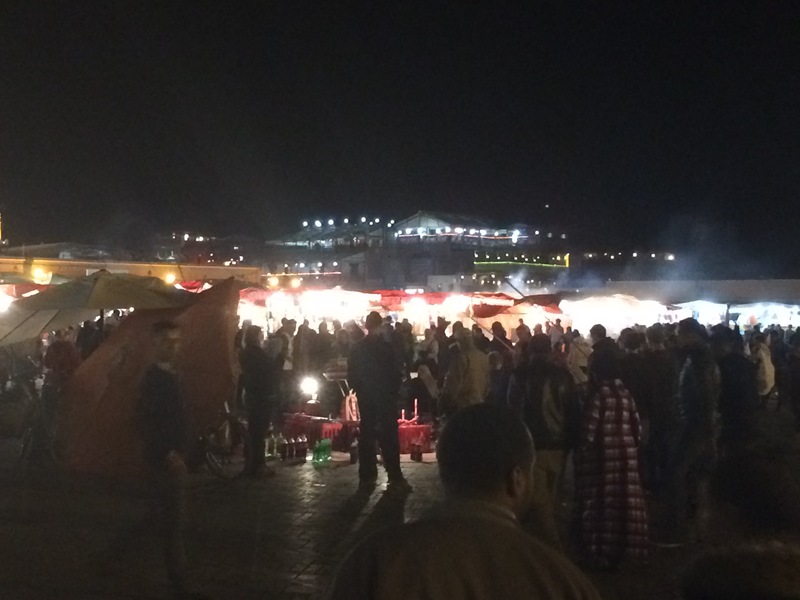 But even more than the souks, Djemaa el Fna is Marrakech, amplified. Snake charmers, musical groups, story tellers, henna tattoo “artists,” guys with monkeys on leashes… it’s almost too much to take in. And there’s almost no getting away with taking photos without getting “caught” and getting asked for money. We did find our best bargain of the trip: a big cup of freshly squeezed orange juice for $.40. 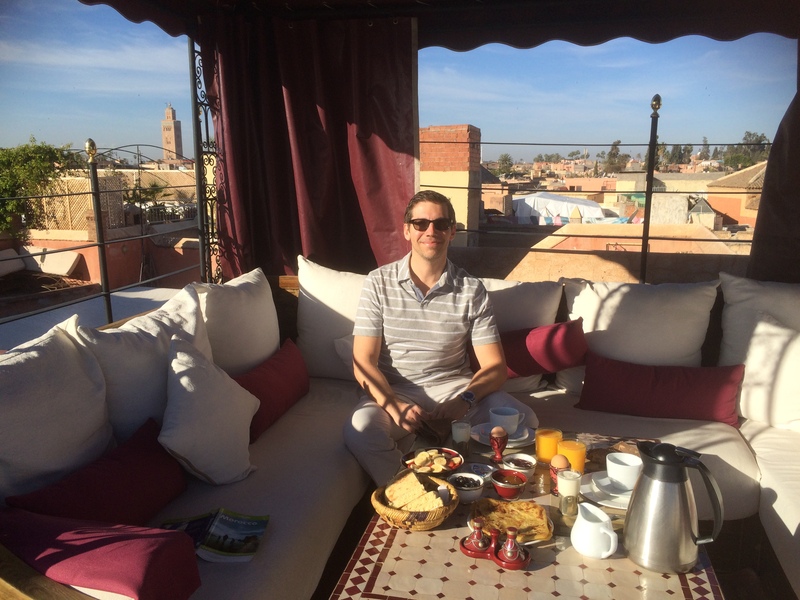 Speaking of which, we ate extremely well and loved the tagines (stews) and the rooftop views. One of my favorite experiences was enjoying a beer near the Palace and watching the storks at sunset, which nest on the palace walls. They also happened to be mating with great urgency and speed, which – you know, from a scientific perspective – was very, um, entertaining! 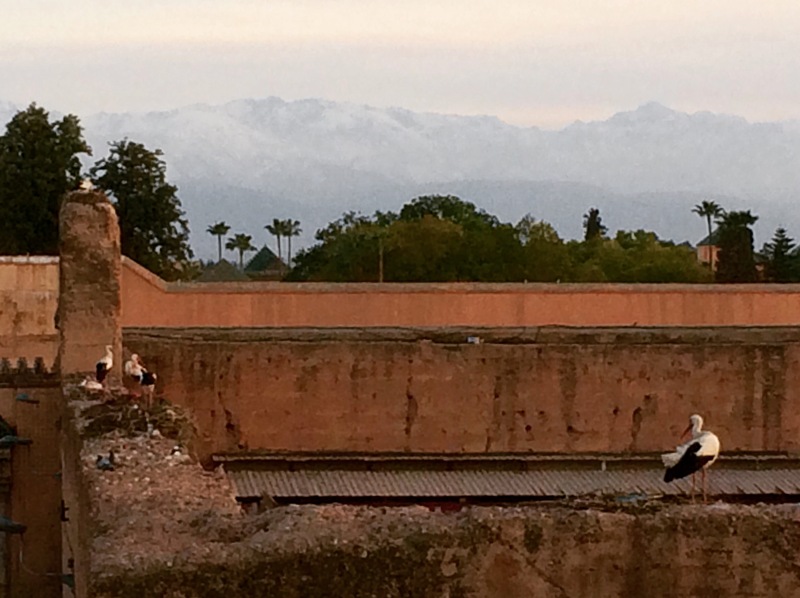 Atlas Mountains providing a romantic backdrop to busy storks! 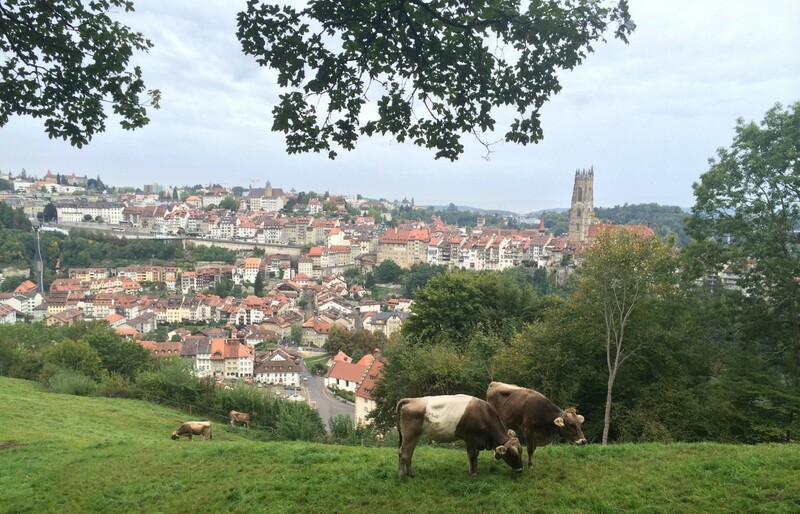 By the time we finished our second full day – with a verrrrry relaxing hammam and spa experience – we were ready to go back home to Fribourg. I could have stayed longer and would LOVE to return to explore more of Morocco, but for a mid-week, grown-up getaway, it was really perfect. Aside from the constant cajoling to buy things, the people of Marrakech were friendly and welcoming, and we always felt safe, even at night. (That said, we did hurry past certain corners our host warned us were populated by “scalawags” who would be quick to take advantage of unsuspecting tourists). Amazingly, despite our return flight being 1.5 hours late, we made it within five minutes of the ski camp buses pulling in. While we were off gallivanting in North Africa, our erstwhile skiers were having a fantastic time with their schoolmates. What a cool opportunity! A week of chaperoned skiing and other fun activities, plus room and board, with all their buddies. So sorry for your loss. Your trip looks like perfect opportunity to process the loss and nurture each other and your souls. Thanks for sharing! I loved that trip! Do you remember where that great literacy/health project was? UNFPA does such great work.